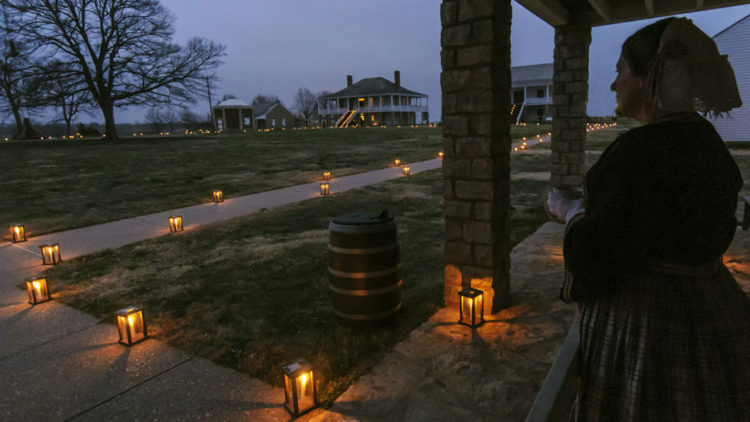 Fort Scott KS – On December 7 and 8, 2018, Fort Scott National Historic Site (FOSC) will present its 37th Annual Candlelight Tour. Tours on December 7 will begin at 6:30 p.m. and leave every 15 minutes until 9:00 p.m.
On Saturday, December 8, the tours will start at 5:00 p.m. with the final tour leaving at 8:45 p.m. Please arrive 10 minutes early to allow time to park, present/pick up your ticket, and get oriented. Tickets go on sale Thursday, November 1st and are available by calling the Fort at 620-223-0310 (with a major credit card) or by stopping by the Visitor Center on Old Fort Blvd. They are $8.00 per person and non-refundable, children 5 and under are free. It is recommended that you get your tickets early for your choice of tour times as this event frequently sells out. Participants are advised to please dress for the weather and the terrain, as they will be outside and on sidewalks. 1,000 candle lanterns illuminate the site and 100 reenactors (plus yourself) bring the fort to life. “This year’s tour will include audience participation. It will feature five stops around the site beginning with the fort’s construction in 1842 and ending with the auction of 1855, where the fort’s buildings were sold to the public two years after the U.S. Army abandoned Fort Scott,” shared Betty Boyko, Superintendent, FOSC. “We encourage everyone to dress up (in modern or period clothes) and step back in time,” continued Boyko. During the tour, you have the opportunity to become a skilled contractor, hired to help build the fort; join in a dance; learn period etiquette and the language of the fan, and enlist in the U.S. Army stationed at the Fort. You will also have an opportunity to bid on the buildings as the fort is sold at auction. Fort Scott was an active military post from 1842-1853, which was a time of rapid growth and change in the country. As Fort Scott was being built, the nation grew west, expanding all the way to the Pacific Ocean. With this growth, Fort Scott changed, the mission of its soldiers changed, the experience of its residents changed, the environment changed, and the nation changed. Soldiers and civilians at Fort Scott lived their lives to the fullest despite the constant change.